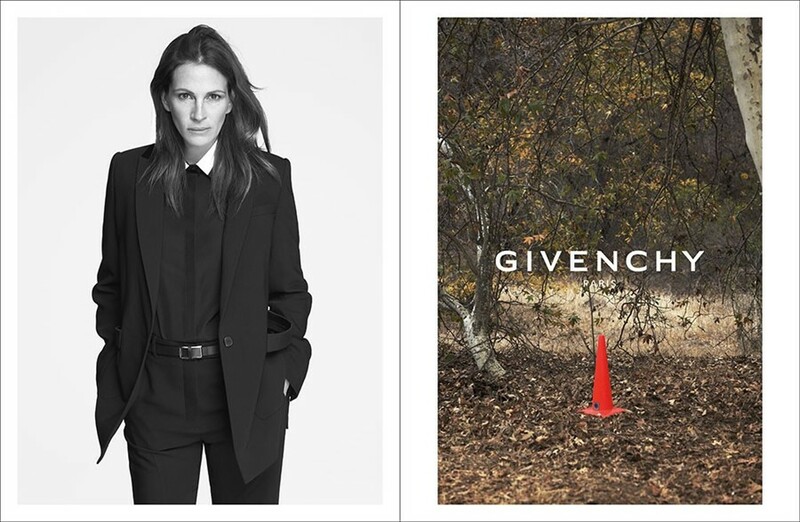 Julia Roberts was unveiled yesterday as the new SS15 face of Givenchy – but it was a very different vision of America's sweetheart that greeted the world. Dressed in an oversized, mannish blazer and stripped bare of make-up, this isn't the Pretty Woman-era Roberts that most people know and love. According to Riccardo Tisci, that was all part of the plan. When Roberts agreed to do the campaign, he specifically warned her that there would be no hair, no make-up and most crucially: no smiling. "She was really cool. She said we should go for it. We did it, and there we are, I’m very happy. It’s a powerful picture." It's almost impossible to think of Julia Roberts without her toothy, Hollywood-gloss smile – which is probably why Tisci wanted it out of the picture. But he also says that the 47-year-old actress wasn't bothered about being pared back. When asked if Roberts was comfortable with going without make-up, Tisci said: "She’s very cool. Of course, she’s conscious of herself. When you’re a well-known designer, you’re paranoid about your looks, so imagine when you’re so well-loved by everybody. She saw the first picture and she liked it, she said because 'I can see myself, my real self.'" And as for his favourite moment in Pretty Woman? The iconic "big mistake, huge" scene in a Rodeo Drive boutique where Roberts' character exacts revenge on a snooty shop assistant. Obviously. Roberts follows in the footsteps of previous campaign stars including Erykah Badu, Marina Abramović and Mariacarla Boscono. Dazed cover star Kendall Jenner, Julia Nobis and Jamie Bochert fronted the last AW14 campaign.